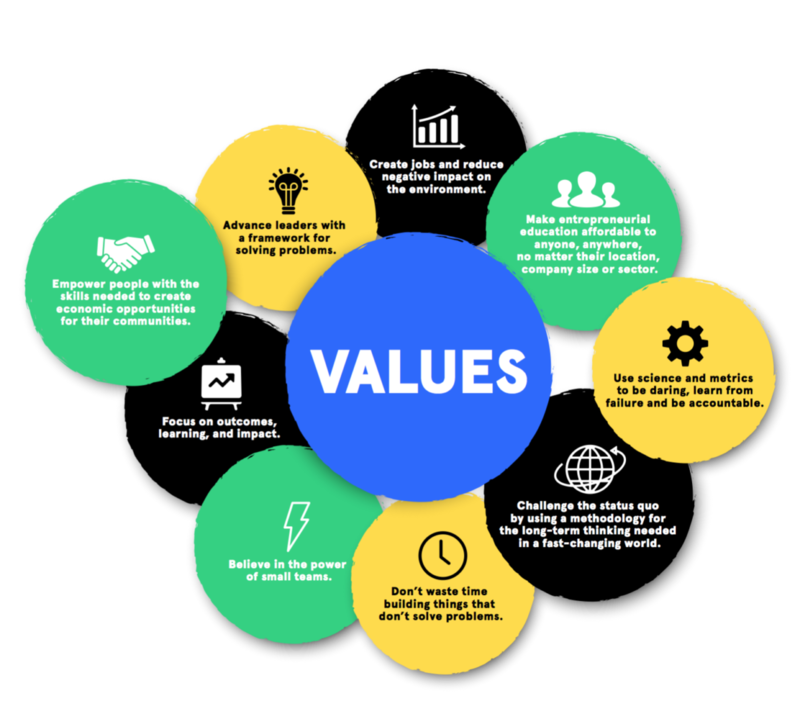 The Values Series, Part I: Transforming How We Think and Work in the 21st Century - Lean Startup Co. I can hardly believe it myself, but this year marks the 10th anniversary of the modest proposal Eric Ries first posted on his Startup Lessons Learned blog. Reactions to his observations were swift and enthusiastic, launching a movement that would culminate in The Lean Startup being published three years later. It’s been three years since Eric and I joined forces to assemble the Lean Startup Company, with a vision to transform the way people think and work in the 21st century. In a world full of uncertainty, we believe in empowering organizations of all sizes and sectors to leverage the power of entrepreneurship as a core function. This can help smaller companies make a stronger impact on the world, and larger companies think more like startups. In one way, the past 10 years have zipped by, but in another it’s hard for me to remember a time before the business world embraced a formalized set of Lean Startup values. Just think for a moment of how different the world was in 2008. An Android meant a robot, a hybrid cloud meant rain in the forecast, and twitterpated referred to the wise old owl in Bambi. We shopped for desktop computers at Circuit City, browsed the movie walls at Blockbuster, and trusted our money to Lehman Brothers. Since then, a tidal wave of bankruptcies and innovations reshaped the commercial/cultural landscape. Three trends crested nearly simultaneously: the global financial crisis, massive upgrades in connectivity, and the emergence of self-assembling transcontinental supply chains. The new world molded by these seismic shifts favors survival of the leanest. As our company built relationships and developed ways to support the community, we were guided by a core set of values. We knew the only way to deliver on the mission of the Lean Startup Co. was to become a model organization ourselves. I’d like to share a little more about those core values, how they were expressed by those Lean Startup methods and how they have helped define our journey over the years. Don’t waste time building things that don’t solve problems. Believe in the power of small teams. Lean for healthcare: Teams are the atomic unit of action in business. From the largest conglomerate to the smallest sidepreneur collective, the effectiveness of the team defines the success of the operation. At the traditional healthcare provider Humana, the Lean Startup transformation didn’t happen all at once. It grew from a single team with a vision. Geeta Wilson, Humana’s VP of Consumer Experience and Enterprise Transformation, said she couldn’t wait for the organization as a whole to adopt Lean Startup, so she took her stakeholders’ permission to do a reframe and just ran with it. “I think we had a significant influence in that we said, ‘It starts with us.’” It did and then rippled across their org chart, success by success. Focus on outcomes, learning, and impact. Advance leaders with a framework for solving problems. Make entrepreneurial education affordable to anyone, anywhere, no matter their location, company size or sector. Thanks to CEO & Co-Founder Heather McGough for contributing this piece. If you seek to bring the entrepreneurial spirit to your organization, Lean Startup Co. can help.